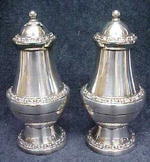 Offering this beautiful silverplated salt and pepper shakers, lovely design, three ornate raised floral bands. Salt has 12 holes, pepper has one center hole. Each measures 4 inches tall, both retain their stoppers. Marked on bottom Ianthe, made in England. Marked on bottom edge side 'silver plated'. Good+++ condition, no dents or damage, no plate loss, a couple tiny specks of pitting on middle section of pepper, more felt than seen, does not detract. A beautiful pair for your table!